721 Howard Street. The Theo Ubique Cabaret Theatre will premiere its first show in this new space next week. After two decades of black box performance, The Theo Ubique Cabaret Theatre is relocating to Evanston from Rogers Park — a move its board feels optimistic about. The theater, which previously operated out of the No Exit Café, produces musicals in an intimate cabaret style and has been the recipient of over 50 Jeff Awards, which honor the best of theatre in the Chicagoland area. The Full Monty, the theater’s inaugural show in their new space, will open in previews next Friday. The president of Theo Ubique’s board, Farrel Wilson, said the move has been in development since 2016, when the city sought a new tenant to fill the space on Howard Street. Ald. Ann Rainey (8th) reached out to Theo Ubique to see if they were interested in the property. Conveniently, the theatre had been seeking a larger home to meet demands of their growing audience. The new 88-seat location on Howard Street can seat over 30 more people than the original space and will help increase their business demand, Wilson said. “It’s a little scary to say ‘Okay, we’re going to do this,’ but to grow you have to take chances,” Wilson said. 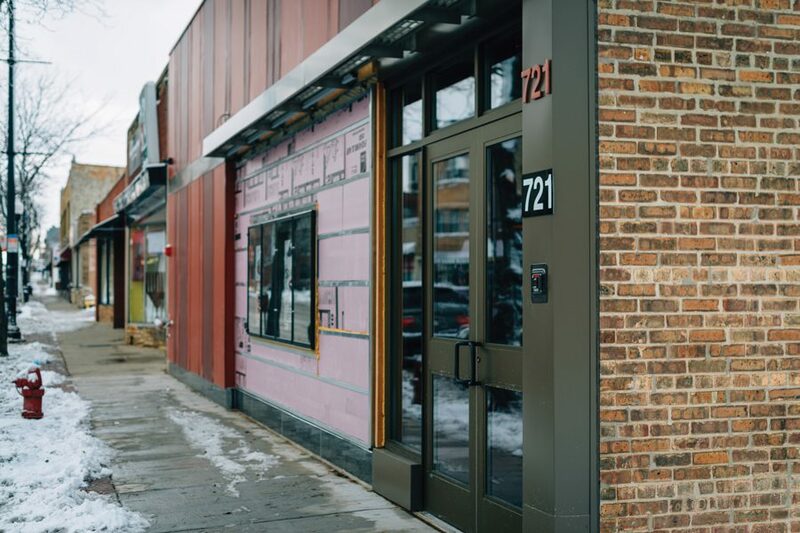 Ben Lipinski, the facilities director for the theater, said although the team is technically just moving north from Rogers Park to Evanston, they hope to retain the audience they’d built in their original neighborhood. While the theater hopes to maintain its nearby frequenters, the staff is also excited to expand to a new community. Lipinski, as a scenic designer and facility director, said the change is beneficial because the space is more customizable to meet the needs of individual productions. The old location, he said, had poles placed in the middle of the stage and tight corners which limited what Lipinski could design. He called the new space a “gorgeous” black box theatre which provides a blank canvas he can work with. “It’s a fun puzzle to work in a black box and really be able to tailor that audience experience and design each spatial experience to fit each show like a glove,” Lipinski said. Fred Anzevino, the artistic director and founder of the theater, said the new space will offer amenities to improve the experience their artistic teams. In particular, he mentioned the No Exit Café had a leaky roof and poorly maintained dressing rooms which were too small to properly accommodate the actors. The new building, Anzevino said, will have improved spaces for the performers and better maintained facilities. The selection of “The Full Monty” as the show to premiere in the new theater, Anzevino said, was inspired because he wanted to have a celebratory, fun play to excite the theater’s patrons about the larger space. “The Full Monty” follows six New York men who who decide to create a one-time strip show in a desperate attempt to find work after being laid off from their steel mill jobs. The musical touches on issues of gender roles and class in a light-hearted manner, Anzevino said, without betraying depth or intellect for pleasure. Anzevino said he is excited to produce shows in the new space because it manages to retain the intimate feel of the No Exit Cafe’s black box despite its increased size. The extra space will allow him to do more with the shows he directs, he predicted, while still allowing him to maintain Theo Ubique’s distinct cabaret style.